Dental implants offer permanent fixed replacement set of teeth and single tooth replacement for patients suffering from losing teeth. If you have missing teeth and want a functional and beautiful solution that replicates the structure, look, and feel of natural teeth, then dental implants are likely the optimal solution. There are many types of dental implant available, and your choice of dental treatment will often depend on your circumstances as well as your preferences. Titanium implants traditionally have many uses for most types of treatment. However, zirconia implants are the newcomer on the block and are also available to patients suffering from teeth loss. Zirconia implants are a relatively new alternative to the popular titanium implants, which have been the popular choice since their inception in the 1970s. They are a type implant made from zirconium oxide, a chemical which is close to titanium in the periodic table, and which happens to fuse to the bone and provide a strong and secure base for replacement teeth. Many people look to alternatives because they do not want metal such as titanium in their mouth, or because they seek a more aesthetically pleasing dental implant. Zirconia is light weight, durable, and resistant to erosion from chemicals and fractures. It is also a similar color to natural teeth, and many people choose it because of its aesthetic advantages. Previous uses of zirconia include aerospace engineering and hip-replacements, suggesting both its durability and its biocompatibility when used in surgery. In its raw form it is a metalloid that much resembles titanium, but when heated it becomes lattice-like ceramic dental implants. One of these lattice structures produces an opaque white zirconia which is hard, tough, and chemical resistant. This form of zirconia is the best for use as dental implants and the one that most resembles natural teeth. 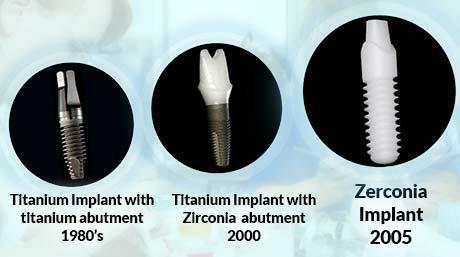 Like dental implants, zirconia has only been on the market for around ten years. Before that, stabilized zirconia was used in many medical scenarios, and has been successfully used for orthopedic hip prosthesis since the 1980s. The first to develop ceramic implants was Professor Sandhaus from Switzerland; he made them from zirconium oxide. Shortly after a holistic dental treatment called The Paracelsus Klinik began to offer the treatment to patients, although they initially recorded poor results. New generations of zirconia implants came to the market in 2005, and then again in 2009, and these improved the procedure and results dramatically. In 2005, surgical instruments were also released which were made from zirconia and allowed patients to have a full dental implant surgery without coming into contact with metal. This is especially useful for those who are sensitive. Today, zirconia implants are becoming an increasingly popular choice of treatment, and are one of the only viable alternatives to titanium. More and more dental implant dentists are beginning to offer the treatment, and more patients are taking an interest in the benefits of zirconia, although time and research will determine whether they have the long term success rate of titanium implants. What Can I Expect From A Zirconia Implant Procedure? A zirconia implant procedure is similar to other types of implant, and regarding the surgery, it will feel very much like a titanium implant. The specialist will fit the implant, which will provide a stable structure for replacement teeth. Aside from the difference in materials used, the surgery is very much the same. The bone is prepared and threaded, the implant is surgically placed to act as the root, and then the permanent replacement teeth are fitted once the implants have the chance to heal. Why Have People Sought An Alternative To Titanium? To understand why zirconia might be a good option, we should take a look at some of the potential drawbacks of titanium implants. However, it is not in our interest at all to discourage the more traditional and well-established method. Titanium has an extremely high success rate when used for implant surgery, and is scientifically proven to fuse to the bone proficiently in a process known as osseointegration. There is a reason why it has been used successfully for decades. Titanium does have several drawbacks, and although they are minor, they do leave room for improvement if another material can prove itself to be equally safe and successful. Titanium can cause allergic reactions in some patients, and adverse reactions later on in others. Titanium implants can also cause electrical activity in the mouth that can stress the nervous system, and titanium oxides can damage the immune system. However, these drawbacks have not shown themselves to be too much of a risk. What is more likely is that people typically seek an alternative to titanium that gives them a non-metallic look and feel. They want the best imitation of natural teeth possible. There may be long term benefits for the patient’s health if dentistry can be metal free. Zirconia has been shown to be biocompatible and fuses with the bone well. There are no records of allergic reactions to zirconia. Does not form oxides, and tests seem to suggest that the zirconia implants are tolerated well by the body. Ceramic zirconia dental implants do not create a voltage like titanium can. Zirconia is a white color that very much resembles natural teeth, and the ceramic feel is much more similar to natural teeth than metal. Should I Get Zirconia Implants? Titanium implants have been used for decades, and are a tried and tested method that has a very high long term success rate that is around 97%. The treatment has made vast improvements since, and the research has been compiled to show that the treatment is both safe, and effective for the long term dental health of the patient. Zirconia implants, on the other hand, are relatively new regarding their use in dental surgery, though their use in hip-replacement suggests that the material is both biocompatible, and safe for use. There have been some concerns about the material being radioactive, but the doses are minimal. Research so far is promising, but until long term follow ups are possible as there is no way to know the success rate for sure. Zirconia negates some of the disadvantages of titanium implants and does not feel or look like metal in your mouth. It’s perhaps the best material that most resembles the feel, looks, and color of natural teeth, and is quickly gaining popularity. You can ask your prosthodontist for advice on both titanium implants and on zirconia implants. They can help you to make an informed decision based on the advantages and disadvantages of both. 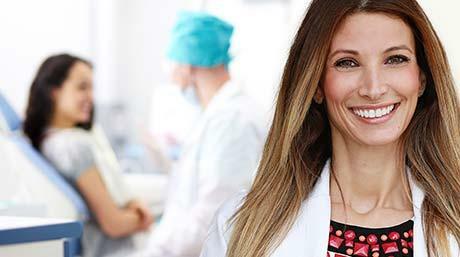 Contact Friedman Dental Group to find out more information about the range of dental treatment options available, or to arrange a free dental implant dentist consultation.